Richard Baxendale established Baxi the boiler making business in 1866, 150 years later they are still going strong and proud of their long UK heritage. Baxi still remains at the forefront of boiler manufacture and design, saying recently “We were at the forefront of the heating industry at the very beginning and we still are as we enter the next phase of lower carbon and energy home heating solutions.” The unit hit the UK market in 2011. The Baxi EcogenmicroCHP boiler was released in 2011 and was the first commercially available wall hung micro-CHP, duel energy unit made available to the UK market. It received the Queen’s award in 2012 for Enterprise and Innovation, a prestigious accolade indeed. 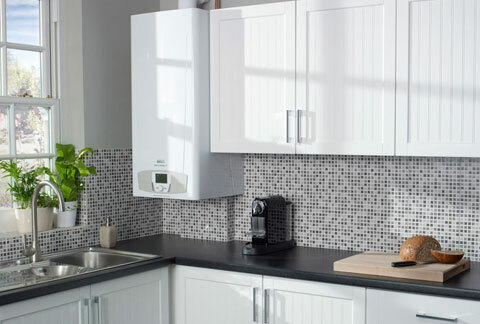 It is described as “a logical, practical and familiar alternative to a regular boiler” on the Baxi Ecogen website. Using a Free Piston Stirling Engine, Baxi Ecogen was designed to be a ‘like for like’ replacement to a conventional boiler, which also generates up to 1kW of electricity that can be used in the property or exported back to the electricity grid. It is MCS certified so is eligible for the Governments feed-in-tariff, making it a cost effective alternative as well as energy efficient. It complies with all current gas boiler legislation and significantly reduces carbon emissions while providing all your space heating and hot water. The way to achieve the maximum energy / cost savings with the Baxi Ecogen unit, is to use the lion’s share of the electricity on-site as it is generated. For example, you could do your washing or ironing in the evening while your heating is on. The installed cost seems to vary anywhere from £4500-£9000 depending on the install. The basic design principles of the Baxi Ecogen microCHP are the same as a regular ‘heat only’ boiler. It can be used on S, Y and W plan open-vented systems. For electricity generation, the Baxi Ecogen uses a free piston Stirling engine, this engine is operated by burning natural gas or LPG. The helium working fluid expands and contracts to move a piston up and down. This piston travels between a copper coil, generating up to 1kW of electricity at 50Hz a phase. The unit can be programmed to only produce electricity, heating and hot water when there is a demand. A regular boiler will operate at the maximum heat output at start up and then progressively reduce the output to meet demands. 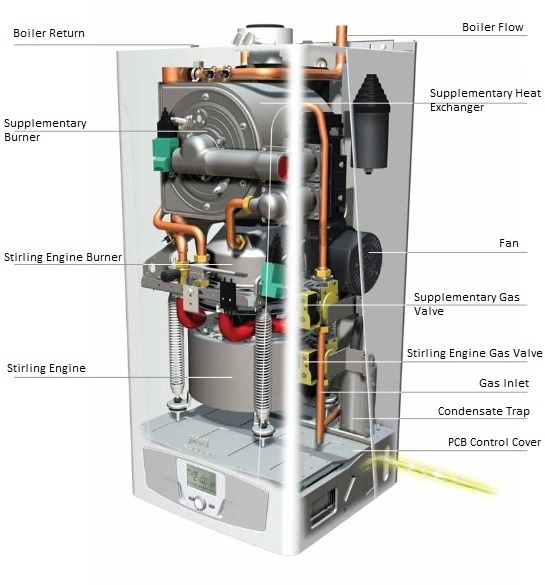 The Baxi Ecogen is different, it starts the Stirling Engine first monitors the temperatures and, if required, the supplementary burner will kick in to meet demand. This gives the Stirling Engine the opportunity to fulfil low heat demands, or keep the supplementary heating to a minimum to maximise electrical output. The unit also has a range of accessories to provide room, outdoor an hot water load compensation for optimum efficiency. It has been said that the Baxi Ecogen can save you up to £600 a year on energy bills by selling electricity back to the national grid. However the amount you save (and make) depends on a wide range of factors. Firstly it would appear that the unit is of benefit in households that require a lot of heating and / or hot water. If the unit is on to create heat for rooms or hot water, then it will be creating electricity that can be used at the same time it is through this method it has been claimed that the unit can ‘pay for itself’. The tariff that you are on from your energy provider can affect the units payback period as can energy price inflation. If your home is using the electricity generated by the Baxi Ecogen, then you should have less reliance on your energy company and their ‘more expensive’ electricity. So as the price of gas and electricity go up, your margin for saving increases. It’s worth stating that if you are creating your own electricity, which is more expensive per kWh than gas, then you are making a saving. Many claims have been made about the unit’s payback period but it’s very hard to work out without precise details and these will alter from property to property. Your best bet is to ask your installer for a detailed breakdown of your current costs and energy requirements and take any figures with an educated err of scepticism! For a product brochure and more detailed information, along with a list of installers and suppliers in your area please visit our product catalogue. If you have had any experience with the Baxi Ecogen Boiler and would like to share it with people looking to invest in a new boiler, then the microCHP section of our renewable energy forum is the perfect place for you.